NEW – Sign up to receive email reminders for Fieldstone Common. Emails will be sent out once a week on Wednesdays. 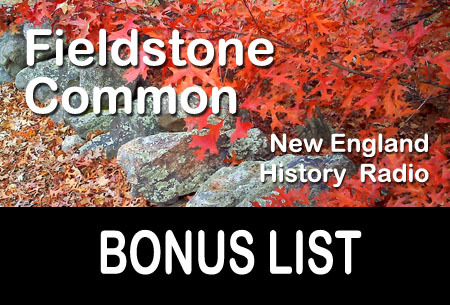 Enter your email address and then on the second page you will have the option to choose Fieldstone Common. 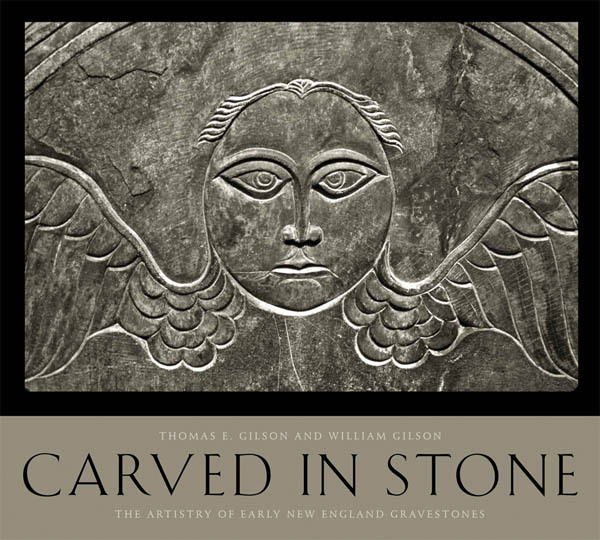 Following are some items that were mentioned during the 24 January 2013 Fieldstone Common interview with Thomas and William Gilson, authors of Carved in Stone: The Artistry of Early New England Gravestones. William Gilson is a writer now based in England. Thomas Gilson is a photographer based in New York. You can view sample images of the gravestone photos from the book on Thomas Gilson’s website. The book Carved in Stone: The Artistry of Early New England Gravestones, published by the Wesleyan University Press, is available for purchase from major books sellers online and off such as Amazon.com. Three well-known gravestone researchers/authors were mentioned during the interview: Harriette Merrifield Forbes, Allan Ludwig and Vincent Luti. A great reference tool for viewing early 20th century black and white photographs of New England gravestones, many of which were photographed before stone deterioration, is the Farber Gravestone Collection at the American Antiquarian Society. A great place to learn more about gravestones and their carvers is the Association for Gravestone Studies. Be sure to check out their scholarly publication, Markers. You can view gravestone photos by Marian Pierre-Louis on her blog, the Symbolic Past. 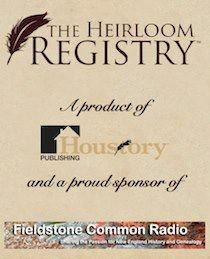 The Wesleyan University Press, the publisher of Carved in Stone: The Artistry of Early New England Gravestones, donated a copy of the book that was given as “door prize” during the live show. The copy went to a listener in Massachusetts. A big thank you to the Wesleyan University Press for their generosity! 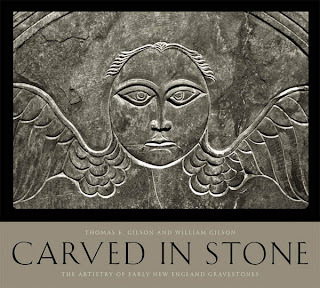 This Thursday on Fieldstone Common we will speak with authors and brothers Thomas and William Gilson about their book Carved in Stone: The Artistry of Early New England Gravestones. Gravestones are colonial America’s earliest sculpture and they provide a unique physical link to the European people who settled here. Carved in Stone is an elegant collection of over 80 fine duotone photographs, each a personal meditation on an old stone carving, and on New England’s past, where these stones tell stories about death at sea, epidemics such as small pox, the loss of children, and a grim view of the afterlife. The essay is a graceful narrative that explores a long personal involvement with the stones and their placement in New England landscape, and attempts to trace the curious and imperfectly documented story of carvers. Brief quotes from early New England writers accompany the images, and captions provide basic information about each stone. These meditative portraits present an intimate view of figures from New England graveyards and will be enjoyed by anyone with an interest in early Americana and fine art photography. Thomas E. Gilson is the author of The New England Farm, a highly praised book of photographs. He taught black and white photography in Vermont for 17 years and was managing editor and photographer for the New England Farmer. His photographs have been widely published and exhibited. 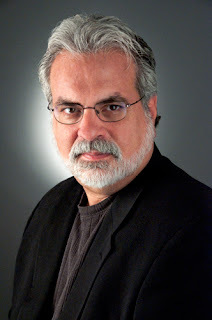 William Gilson attended the University of Connecticut, and his writing has been published in journals and magazines including New England Review, Orion, and Poetry Salzburg Review. The Gilson brothers were born and raised in Connecticut. Following are some notes on items that were mentioned during the 4 October 2012 Fieldstone Common interview with photographer John Thomas Grant, author of Final Thoughts: Eternal Beauty in Stone. You can learn more about John Thomas Grant at his website and you can follow him on his blog, Facebook, Twitter and Google+. John is involved a joint business venture called The Passion Projects with Lisa Griffiths. John and Lisa are both busy working on upcoming books. Lisa will be publishing International Steampunk Fashions in January 2013 and another called The Fashionable Victorians and Edwardians. John and Lisa are also working on a television show called All Things Victorian. John is working on a number of projects including two civil war books – one which is a collection of civil war letters and the other on a 12 year old civil war soldier. He also has in the works two more cemetery photography books called The American Cemetery and Death in Color. Schiffer Books, the publisher of Final Thoughts: Eternal Beauty in Stone, donated a copy that was given as a door prize during the live show. A big thank you to Schiffer Books for their generosity!